Maggie Cavalenes is a third-year public relations student, who is also working toward her Public Affairs Communications Certificate. How would you describe yourself and other students who show “#GradyGrit”? I think a student with #GradyGrit is one who puts in the extra effort to find things to get involved in that are off the normal path. 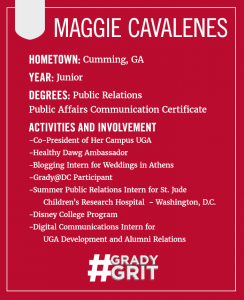 I really enjoy having my hand in non-traditional organizations for a Grady student – I am the only Grady major who serves as a Healthy Dawg Ambassador, for example. I also really hope that I come off as approachable and friendly. I am a definite realist who will tell it like it is, but in a nice way. There’s no need for negativity in an empty space – I try to come into things with positive energy and with the hope of receiving good things back. Aside from participating in Grady@DC, I have lots of great memories attributed to Grady. I think something special for me was simply my admittance to Grady after attending camps (the Grady Games!) here during high school for two summers in a row. I’m a big fan of things feeling full-circle. I think Grady is somewhere you can feel like an individual. When we apply for internships, or work for a big organization, it can definitely feel like you’re a number. The faculty and fellow driven students at Grady make me excited to be in class every day, and I know that the people at Grady care about me as a person, and not just as a statistic. What is your dream job with your Grady degree? This is a really hard question for me, because my answer changes every day. With my public relations degree, I can see myself working for a big firm, maybe in crisis communication. 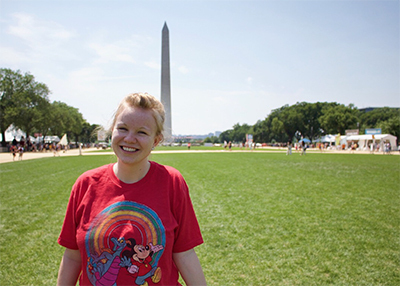 I’d love to work in public relations for The Walt Disney Company, or somewhere in Washington, D.C. In a far off realm, my degree would land me in a television writers room. See? I can’t make my mind up just yet. How did you get started with Her Campus and what do you like to write about the most? I joined Her Campus during the start of my freshman year in the hopes of finding a group similar to newspaper and yearbook, which I had been involved with throughout high school. Her Campus has given me great friends over the last few years, and I have been able to climb the executive board ranks. I started as co-president in January 2019! I write articles less frequently now that I am in charge of general club communications and other presidential tasks, but I always enjoy writing about television shows, music and personal narratives. Tell us about your summer in D.C. I could talk all day about how I loved being in Washington, D.C. last summer. It was super hot and muggy, yes, but there’s something really special about living in Delta Hall with 30 other students. We all worked 9-5 internships and then came back to the house and were able to unwind together by cooking meals and watching reality TV. I really enjoyed taking advantage of D.C.’s free sights, as well as visiting the surrounding cities. I learned so much about the history of our country, as well as getting my first “real world” job experience. Cavalenes spent last summer working for St. Jude in Washington, D.C.
My personal internship highlight was starting a fundraiser for St. Jude with District Taco, a chain local to the DMV area, that ended up raising over $10,000 for the kids of St. Jude. Another highlight might have to be buying last minute tickets to see Taylor Swift in Maryland! How has being a Public Affairs Communications and Grady student impacted your college experience? Without PAC, I wouldn’t have studied in D.C. or interned with St. Jude. Being a PAC student immediately set me apart for the better – when I was a freshman, I had thoughts about double majoring in Political Science and Public Relations. My government professor, Dr. Brittany Bramlett, suggested that I look into the PAC certificate. From there, I contacted Victoria Cooper, my beloved advisor who recently left Grady, and was signed up for Intro to Public Affairs. The rest is history! Also, that’s my plug to go to office hours – that simple meeting later led to me interning in D.C. Whether he wanted it or not, Professor Joseph Watson has turned into someone who I go to before making any decisions that have to do with my college career. He has been advantageous to me in finding internships, and also just for just having good conversation. I am glad to have him as a professor and colleague. I have also met several friends in PAC that I wouldn’t have met without taking those classes. What draws you to studying political science? I was more drawn to political science during my freshman year. I don’t think I actually want to work in politics – it’s a little too complicated for me. Still, learning the ways of political communicators is fascinating. I really love strategy and crisis situations, and politics is full of both. Please we’re dying to know, give us one Disney secret??? Rumor has it: The “It’s A Small World” ride is running 24/7. It would be too much of an ordeal to reset the moving parts to the music, so instead it just always goes. College student pro-tip: People of any age can order kids meals. Save money where you can! Mythbusted: I’ve seen articles claiming cast members can’t say “I don’t know” – I was never told this. However, if I ever didn’t know something, I redirected the guest to another cast member who did know the answer. 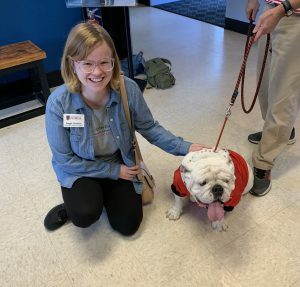 Cavalanes was part of the Student Tour of Georgia over spring break, where she met up with Uga. Over Spring Break, I was part of the inaugural Student Tour of Georgia. This free program from the offices of Student Affairs and Public Service and Outreach was really cool to be a part of. Twenty-five students, myself included, got on a bus from Monday to Friday with stops all over the state ranging from Atlanta to Savannah, and learned a ton about UGA’s role in everything from economic development to agricultural sustainability. I think the highlight would have to be meeting Uga X at UGA’s Marine Extension on Skidaway Island! Everyone should considering applying next year! Tangled, obviously. I also really like Aladdin and The Lion King. Catch me at the theater on opening night for Frozen 2!